Upsana Joshi, IDC's customer service and equipment research manager in India, said: “In 2018, online brand sales were eye-catching, with online sales reaching 38.4% in 2018 and 42.2% in the fourth quarter. This is due to the fact that e-retailers have been able to promote affordable multi-round promotional discounts through various financing options, cash back offers and repurchase programs. Domestic mobile phone brands such as Xiaomi, Glory, Realme, Asus and OnePlus have increased online sales. 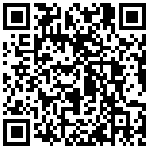 The discounted efforts further boosted online shipments, resulting in an online channel growth of 47.3%." 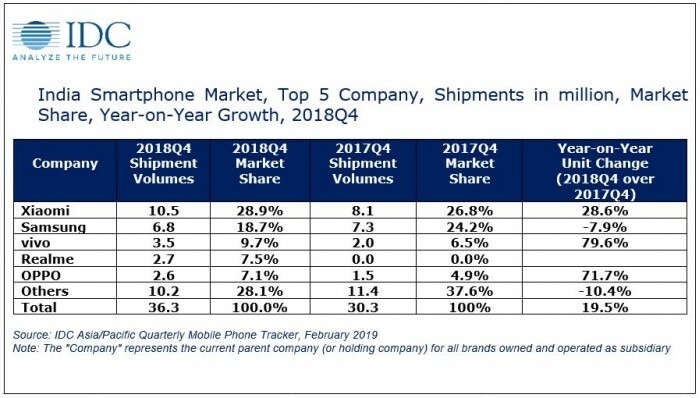 In terms of the proportion of mobile phone brands, Xiaomi continues to dominate, with a 28.6% increase in the fourth quarter of 2018. This is mainly due to the successful marketing of the “Red Rice” series of mobile phones, and the expansion of the offline market through the selection of partner projects and the opening of stores in rural areas. 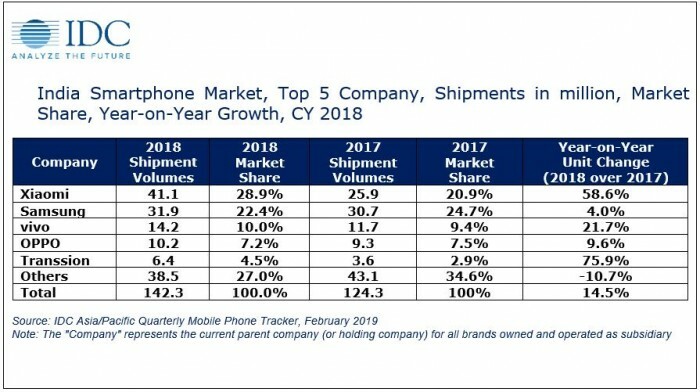 Xiaomi's Red Rice 5A and Red Rice Note 5/Note 5 Pro series are the fastest growing mobile phone models in India in 2018, with global shipments exceeding 10 million units. In addition, the sales share of Xiaomi's online channel accounted for 47.2%, and surpassed vivo in the fourth quarter, becoming the second place in offline sales. Samsung is still in second place, but it fell 7.9% year-on-year in the fourth quarter of 2018. The new Galaxy A7 (2018) is equipped with three rear-facing cameras, which ushered in demand in the fourth quarter of 2018, followed by the Android Go model Galaxy J2 Core. 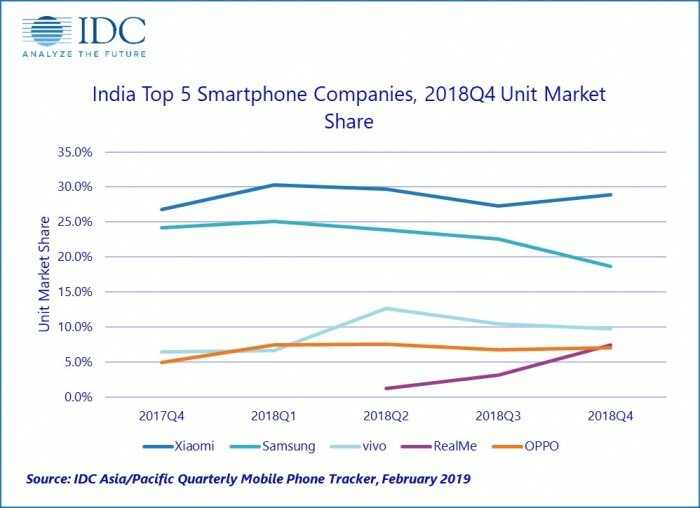 Vivo continued to maintain its third position, with a year-on-year growth rate of 79.6% in the fourth quarter of 2018. Y81 and Y71 and other popular series of mobile phones and the flagship series of V11 and V11 Pro series have a good sales. Realme entered the fifth-ranked supplier list with its affordable and affordable Realme 2 and Realme 2 Pro series. The brand also jumped from fourth place in the third quarter of 2018 to second place in cyberspace, with a share of 17.3% in the fourth quarter. The brand initially expanded its footprint to offline channels through large retail stores like Reliance Digital and gradually expanded to traditional physical stores. The second quarter of millet growth rate in the world's first Indian market super Samsung has been "called the king"